After reading Eiling's post on her visit to Jogoya buffet in Starhill, I was very eager to go there. I had heard a lot of nice things about Jogoya, and had wanted to go there many times but kept putting it off as I felt it was a bit too expensive for me. However, I really think I should go there at least once. Furthermore, I am a big eater and maybe with the amount of food I eat, it may turn out to be not that expensive after all! With this in mind, I asked my friend who had earlier went with me to the buffet at Lemon Garden Cafe, Shangri-La whether she wanted to go Jogoya, and she immediately said yes! But before we went there, we decided to go for some window shopping at Pavilion which is located just opposite Starhill. Since the dinner buffet only start at 5pm, we still had another two hours to go so why not walk around Pavilion first? We stopped by this art gallery on Level 6 of Pavilion called Ode To Art. I came across some interesting sculptures and took some photos. I was not really sure if you could take photos in an art gallery, but as no one was watching, I quickly snapped some. Look at what this naughty boy is doing below! Can't see? Let me enlarge the image a little. Now you see? Naughty, naughty! Hehe. There were other weird sculptures in red colour, but I thought they look ugly, so did not take any photos of them. OK, maybe I don't know how to appreciate them but you can check them out here. 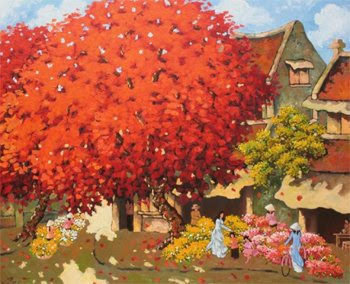 I thought those oil paintings by Vietnamese artists were really beautiful. There were some that really stood out literally as if they were in 3D. I had wanted to take some photos of them but decided not to as I noticed a staff member was observing us. So here are some of the paintings I took from Ode To Art website instead. Aren't they beautiful? 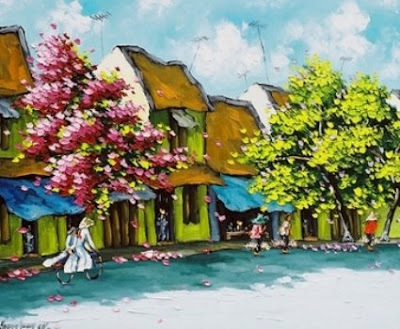 I have a friend who loves these Vietnamese paintings and he would go all the way to Vietnam to buy them. It seemed that these paintings were sold very cheaply in Vietnam, a fraction of the price you would find here. Just to make a comparison, he bought a painting in Vietnam for less than RM2,000. When I compared it to a similar painting in Ode To Art, I was astounded to find that it was sold at the art gallery for RM10,000! If you like to see more of these paintings or other types of art, you can check it out at the Ode To Art gallery in Pavilion or if you are too lazy, just visit their website. Now I started this post intending to blog about my Jogoya experience, but as usual, got carried away with something else so I guess you would have to wait for my next post to read about it. Meantime, have a nice weekend, everyone! You are one "naughty" boy for snapping that other naughty little boy..;) hahha. 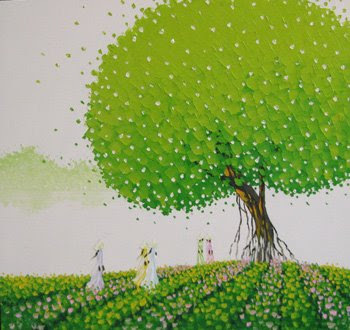 I love the Vietnamese artwork...very good esp the one with the green tree. My goodness this is interesting! I would love to visit there! Great pics and thanks for sharing! lol. the notti boi. haha. btw, i am also not an artsy person, the paintings just bore me. jogoya pics pls! health nut wannabee mom, thanks! Are you back from your vacation? wow, the paintings are beautiful. The colours are so vibrants, aren't they? I'm not much into art and all that but I like that naughty lil fellow ... LOL! suituapui, this is not a food blog lah : ) But Jogoya post coming up next! Cute and nice pictures. I can spend hours looking at nice paintings. I love art so these (impressionist) paintings are a breath of fresh air, Foong. Thanks for sharing them. 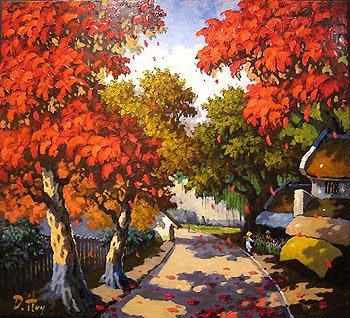 These paintings must be done lately because paintings done by Vietnam artists used to be about boats and rivers and the paintings used to be rather drab. I've got some. I also have some done on wooden panels - blackish. Yes, they are much cheaper in Vietnam. AirAsia flies there now - both to HCM City and Hanoi. Btw, don't forget to get some trinket boxes, those black shellac ones. Great as gifts. They are so indecently priced here. pete, didn't know you like art too. Thought you only like food. LOL! acura, yeah, better buy in Vietnam! hehe the naughty boy is funny. ok make a replacement. me with the naughty boy ok? lol. You are "naughty" but cute, waiting for your Jogoya experience. faisal admar, you want to be the naughty boy? Be my guest! Let me get my camera ready. LOL! I love the use of colours by Phan Thu Trang. And yeah, the prices of art by foreign artists are jacked up ridiculously in local galleries. missmall, yes the prices are jacked up so better buy it directly in Vietnam. I guess the rental at The Pavilion is not cheap either, so they definitely have to sell those paintings at a much higher price. Perhaps you would like to visit my website and learn a little more about 'working with a pendulum'. Art laboe show concert this saturday at the glen helen pavilion in devore? i wanted to know if anyone knew if i can just purchase tickets at the box office at the date of the show this saturday or do i have to buy them through ticketmaster ahead of time?